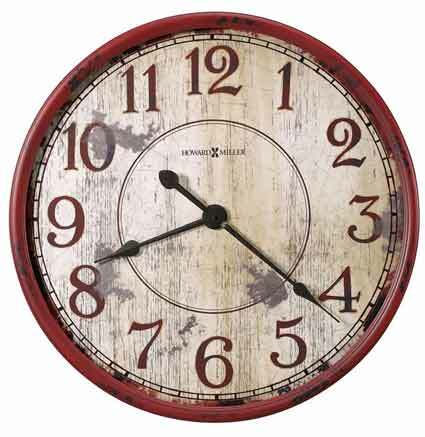 The Howard Miller 625-598 Back 40 is a rustic over-sized wall clock that is a full 32" wide and features a highly-distressed Antique Red finish for an aged appearance. 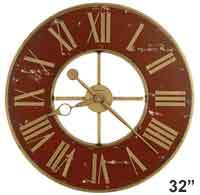 The dial portrays a worn, aged look of vertical grain weathered planking with open hand design. Rusty brown Arabic numerals and aged rusty black hands. 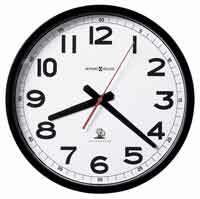 Quartz battery-operated movement requires one AA battery. 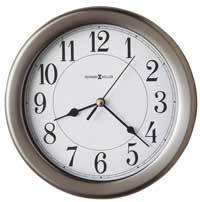 Clocks for sale at The Clock Depot including the 625-598 at discount prices.